Are you tired of seeing this when you look at your platform JAR in Eclipse? Or how about this when you’re debugging? How am I supposed to debug this? Android is open source, right? So how do we see the source? Tip: If you’re just here to get it working and don’t care where it came from, you can skip on a bit. This article summarizes and augments three other posts that spelled out how to get the source and use it. It is surprisingly difficult to get your hands on the correct version of the source you need for this purpose, so in addition to describing that process I’m providing the end result for your convenience. Both the posts and the comments were very helpful, but somewhat out of date now. How to put it all together? The source is all available, but it’s spread out among several projects which put together constitute the Android Open Source Project. Thus I needed to install the repo tool (as described on the “Get source” page) in order to pull down all of the relevant git repositories. The articles describe getting the latest code – the trick is getting the code specific to the platform version you’re working on; at the time everyone was working with 1.0! Of course, branches are generally moving targets, so caveat emptor. If you follow the above and have a good connection and some patience, you’ll eventually have a directory full of some 2GiB of “stuff,” some of which is the source code you’re looking for. But Eclipse needs just the source, in just the right place. 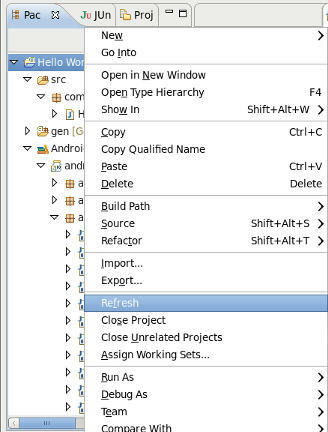 Forster’s post “View Android Source Code in Eclipse” provides a python script for rounding up the source code and creating a nice zip archive out of it, and Burke’s post “Browsing Android Source in Eclipse” describes how to figure out where to put it – in a “sources” directory created underneath the SDK platform directory. Other comments on those posts are helpful for coercing Eclipse to recognize that the source is available. 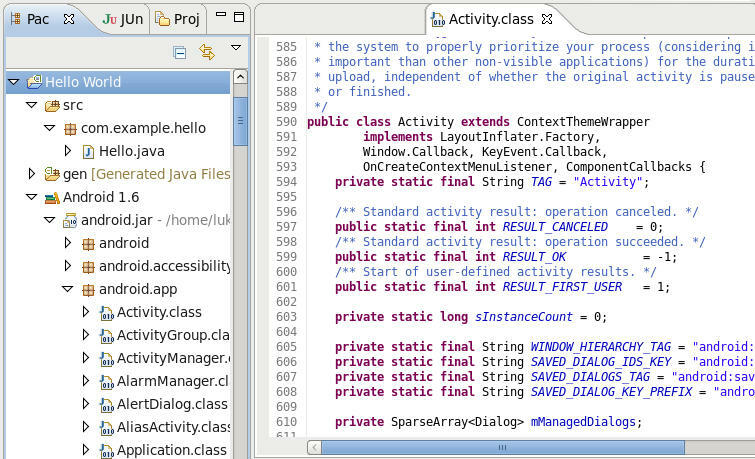 Without further ado, here’s how you attach source to your platform classes. N.B. 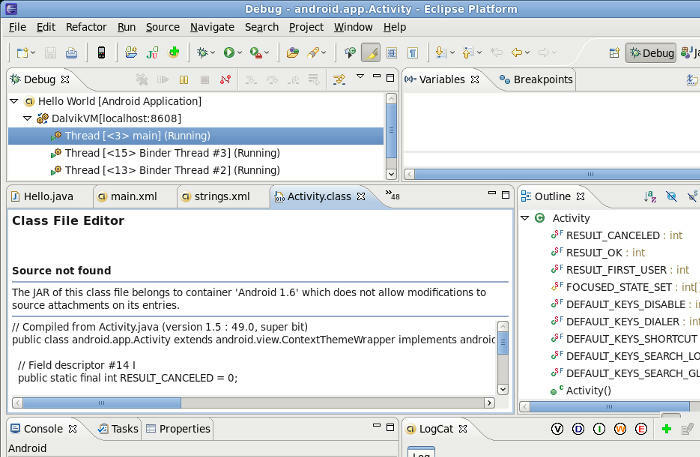 all screenshots are from Eclipse 3.5 “Galileo” – other versions may differ significantly. Download the zipped source code that I’ve gathered for each platform you are developing for. For each platform, create a folder “sources” under that platform (e.g. sdk/platforms/android-1.5/sources) and unzip the source code into it. Then refresh your project (select project and press F5 or right-click and select “Refresh”). Voila, you should see the source! YES, I SEE the SOURCE! 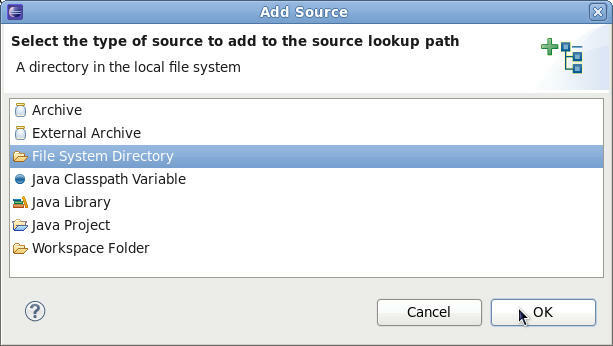 Then choose the source directory where you unzipped the code. 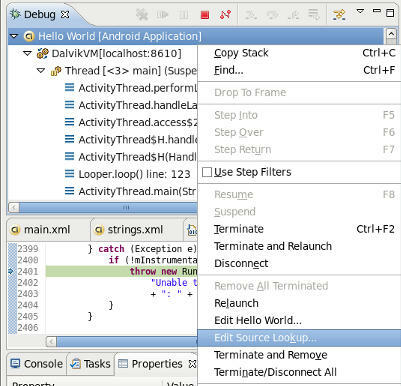 The debugger should now show all the code you can debug into. Source in the debugger... which may or may not help you figure out what went wrong; in this case, a layout error caught at runtime. A word of caution, though: Eclipse’s debugger seems to think that once you’ve set a source lookup for one project, it’s relevant for all of them. If you’re using different platforms for different projects, you’ll want to change the source it uses. You can do that by right-clicking on the project in the debugger and choosing “Edit Source Lookup” to repeat this process. Hopefully this guide makes attaching source easy for you. If the code provided here seems out of sync with the platform when you’re debugging, let me know. If someone knows a better way to pick out the exact code for the different platform versions, comment below. If I’ve slightly (or utterly) misrepresented something, correct me. If you’re just happy to finally see your source, I’d be glad to hear about it! Does anyone know where to get Android 2.2? RE Jason #5 – Not sure what you mean, but I think the middle section above describes the process… once the source repositories have been downloaded, the script from “View Android Source Code in Eclipse” (http://blog.michael-forster.de/2008/12/view-android-source-code-in-eclipse.html) will bundle up the relevant sources into a zip for you; a jar is a zip file, not sure if that answers your question? Thanks for your work, you saved me quite a bunch of time. Extremely useful, thanks! Took me a few hours to do this last time, but with your ZIP file it’s a breeze. Awesome job putting this together. I laughed out lout when I saw the first two screenshots… yes I **AM** tired of seeing that! Thanks for the ‘fix’; it’s appreciated. Please ignore my last comment. It seems I had the source after all. Thanks for this tarball. It really helps. 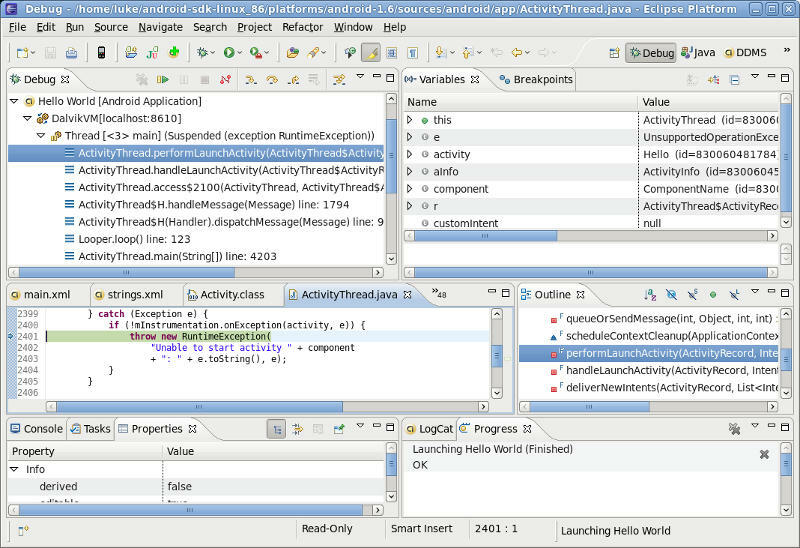 However, when I receive a runtime exception in android.app.ActivityThread there’s no source. So perhaps for your next release you might include this class too. Thanks for spending the time to put this together, you saved me and others lots of time, download, unzip, refresh… worked first time … excellent. There is much win, here. Thankyah. Great! This is exactly what I’m looking for. Thank you! 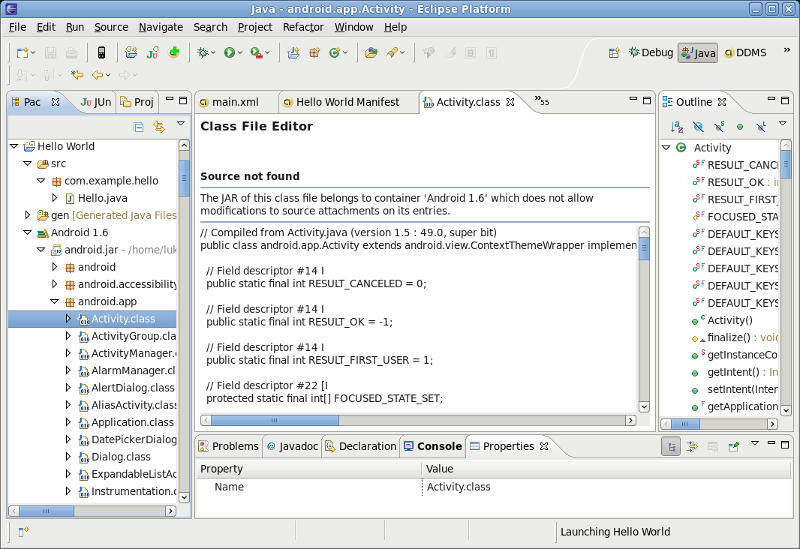 I still can’t get the source to show up in the java perspective,though.Would appreciate any advice on that. Thanks for the great work!! My eyes popped out when the debugger went right into the source! You’re a gem! Hi.Great work! I have a little problem setting up the debugging though,the source code just doesn’t come up for me. 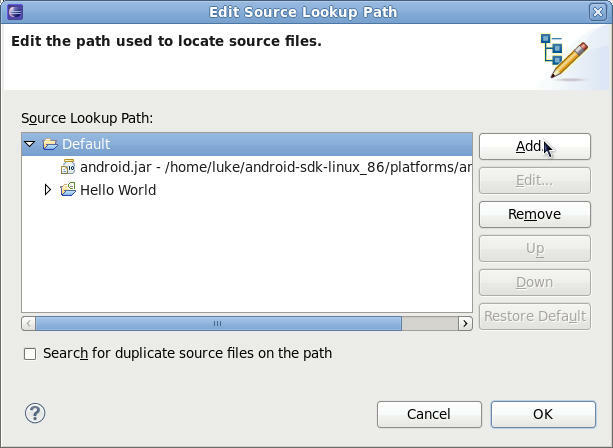 I pasted the contents of sources-1.5-cupcake into sources folder of android-1.5 and refreshed eclipse. no change. Could it be possible to make a source zip for 2.0 and 2.0.1 as well? You are an absolute star. Thank you so much. Really excellent post. Just what I needed. This approves how android expect where the sources folder are. Thanks man, much needed and much appreciated! Guys, I think I have figured out how to get sources matching a particular tag. After ‘repo init’ with the required branch (-b), if you go to ~/mydroid/.repo/manifests, you will see manifest files for each tag. Do a ‘repo init -u git://android.git.kernel.org/platform/manifest.git -m android-2.0_r1_snapshot.xml’ or something similar. Right now, I see manifest files for tags only in eclair branch. I’ve done this the long way before, via Cygwin and Git (in windows), but it is very nice to have have all of the code bundled up in ZIP files like this. I’d been dreading getting my workspace up to date, but it only took me a few moments. Thank you! Thanks a lot, this solves my problem!